What is Article 13 and why should I care? You won’t find much mainstream coverage on Europe’s controversial ‘meme ban’ and getting your head around it might take until Christmas, but perhaps it’s this lack of transparency that allowed this legislation to get passed, despite MEPs initially voting against it this July. 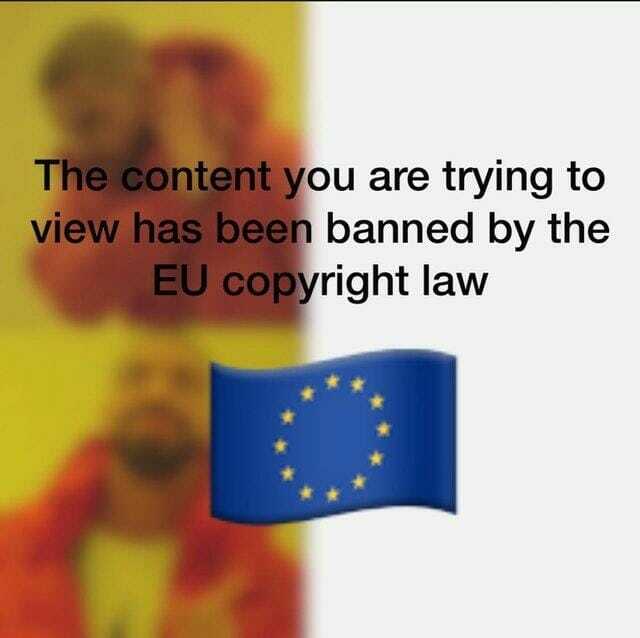 On September 12th, the European Parliament in Strasbourg gathered to vote on an amended version of the EU copyright law, with 438 voting in favour of the new legislation, 226 voting against and 39 abstaining. The original draft in July was rejected by 318 MEPs voting against it, compared to 278 voting in favour. Article 11 and 13, both respectively dubbed “link tax” and “upload filter” would put an end to the internet as we know it. Article 11 coming to fruition would require social media sites and news aggregators such as Google News to pay a tariff for sharing content on their platforms from new outlets. This charge could incur from hosting something as basic as a hyperlink to a news source. Although Article 11 does state that “insubstantial parts of a press publication” would not result in a charge, it doesn’t quite define what insubstantial means in terms of how many words or links could be used. Article 11 on the surface looks like great news for news outlets such as The Telegraph or The Daily Mail, who have been suffering from a decline in newspaper sales and who suffer from sites such as Facebook using their content without paying. However, experiments on charging news aggregators in Spain and Germany before the vote took place showed that publishers never actually saw any revenue coming from content hosts as many of them simply refused to pay for hosting links, decreasing overall visibility and access to news sites. Google news to this day is still unavailable in Spain and has resulted in a significant drop in traffic to Spanish news sites. Article 13 aims to protect any copyrighted material on the internet, such as music, video and even film stills-which is most internet memes seem to be based on. Sites such as YouTube and Instagram would become liable for copyright and would have to filter through all uploaded content, running each upload against a library of copyrighted material, which could take hours and would have no guarantee of getting it right, as we have seen before with YouTube’s current algorithms. Established artists such as Sir Paul McCartney have urged MEPs to support article 13 before the vote, ensuring that the legislation will close t he gap between the value that platforms such as YouTube gain from hosting music and what they actually pay creators of the music. If you have ever looked for a particular song on YouTube, you’ll have noticed that there is often the official video from the artist’s account, and then several uploads of the song from ordinary YouTube accounts. Article 13 would propose to filter and censor these unofficial videos of the song, therefore driving traffic to the artist’s account only. Whilst this change, on paper, would ultimately benefit established artists, the business model of Google, Twitter and YouTube all rely on user-generated content, such as remixes, film snippets or even memes. It’s to no surprise then that these sharing platforms have all come out against Article 13 and 11, claiming that the creative community on these platforms will be stifled and largely inaccessible, impacting on content creators who rely on a subscriber basis for a large portion of their income. The practicality of both Article 11 and 13 do seem far-fetched for now. Although the legislation has now passed, they would both need serious fine-tuning in order not to completely alienate sites such as Facebook, YouTube and Twitter from EU audiences. The basic principles of liking, linking and sharing on these platforms would render them incompatible with creators and consumers in the EU, forcing them to either rethink their business model or maybe even pull out if agreements can’t be reached in EU countries. It’s also worth noting that just because an activity has been banned or made illegal doesn’t mean that there has been a complete stop to this activity. More often than not, the activity just gets diverted underground-such as knife and gun crime in the UK, where there are no safety standards on these often-modified weapons, and buyers are at the mercy of dealers and gang territories because of the lack of legal protection, therefore weapons will always end up being far more dangerous to use. The same principle would go if user-generated content were to get filtered and possibly censored in the EU, there would be nothing stopping consumers and creators purchasing a VPN for less than £50 and driving internet activity underground and ultimately away from publishers and artists that the legislation is meant to protect.